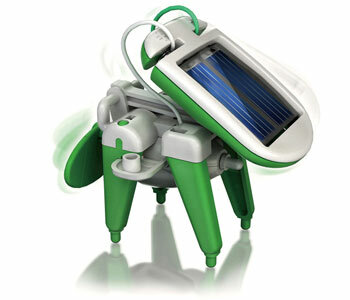 Forget batteries - harness the power of the sun for your next science project. This kit allows you to interchange parts to build 6 different solar powered robots including an airboat, a plane, a robotic dog, a windmill, a car, and a revolving plane. 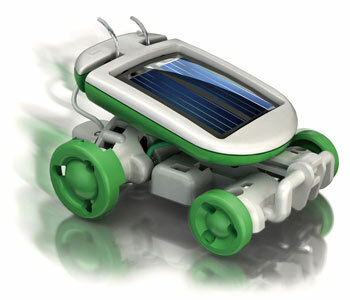 Each is powered by the sun (or a bright indoor lightbulb) and each is easy to assemble. See how much light is required for each kit. Find out if sunlight is just as strong through a window as it is directly. Projects range in size from 7 cm to 22 cm. For ages 8 and over. I gave it 4 stars because the car didn't work very well but I managed to get it to work. used the wind turbine to pop bubbles The dog wobbles into the shade and stops working but is still quite cool. The Boat went quite fast and worked underwater! But the hovercraft didn't hover. Took a while to get the plane to balance. Be nice if you could make more than 6 models through. 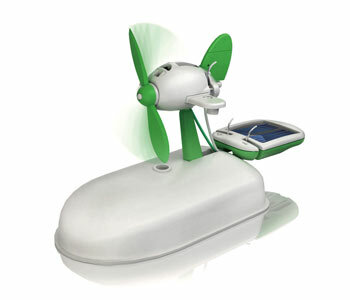 these are awesome for children they cann learn how powerful the sun is! !and what you can use it for!